I remember hearing ages ago that the surviving family of martial-arts icon Bruce Lee had officially licensed his image for a full, photo-realistic CGI recreation. Thus we would be seeing all-new `Bruce Lee' movies starring this silicon-based celebrity resurrection. The thought gave me the creeps at the time. But I had to reflect a bit and tell myself, well, Lee died at 32, leaving his wife and children behind. I can't know what that was like, and if that's one way for the guy to provide for them from Beyond, carnie-exploitive as it sounds, I can't blame the Lees for at least looking into it. Still, one could well imagine it might set a horrific precedent among showbiz's performing-arts vultures (Coming Soon! BRUCE LEE VS. AMY WINEHOUSE IN DALE EARNHARDT SR.'S CIRCLE OF DEATH, directed by Ingmar Bergman!). Don't ask me how the digital revival of Bruce Lee panned out - especially since computer-generated imagery wasn't anywhere near advanced as it is today. But I like to think that cool heads and dignity prevailed in the long run, and I AM BRUCE LEE appears now as a more reasonable alternative. Yes, it is another authorized presentation from widow Linda Lee Cadwell and daughter Shannon Lee. Yes it does bring Lee `back to life,' as it were, and gets his name in Internet Movie Database credits in the 21st century. But it's a deluxe docu-appreciation of the actor-athlete and his philosophy, albeit with a bit of calculated mythmaking (and myth-busting) along the way. Chiefly, director Pete McCormack illustrates Lee's own life and ascent to stardom, point-by-point, by a canny borrowing of clips from Lee's adult movie and TV roles, lifting from The Green Hornet and Longstreet as well as Lee's handful of Cantonese chopsocky quickies that would be endlessly revived and re-released. Besides the home movies and the interviews (chiefly, a famous, much-excerpted one from 1971 that Lee did for Canada’s Pierre Berton Show (on a film-noirish-looking set), there are Lee reaction shots and soul-searching moments lifted straight from THE BIG BOSS, RETURN OF THE DRAGON and so on, blurring the line between entertainment's Cato/"Mr. Lee" (the telling character name in ENTER THE DRAGON) and the real person. By now the tale of Lee's Hong Kong upbringing, his migration to Seattle and California, his training of both Hollywood celebs (Steve McQueen, James Coburn) in his unique martial-arts style of Jeet Kun Do, are well known - especially to viewers of the downright bizarre Universal biopic of the 1990s DRAGON: THE BRUCE LEE STORY (in which we found that Lee's fights in many of his films...were real! Against assassins and demons who happened to infiltrate the movie set!). I AM BRUCE LEE adds a chorus of appreciation to Bruce-mania via drop-in interviews with both Lee associates and next-generation fans. They include UFC President Dana White, fighter/actress Gina Carano (recently in Steve Soderbergh's HAYWIRE), basketball's Kobe Bryant, actor Mickey Rourke, musician Taboo, and a couple of Youngstown guys, boxer Ray Mancini and sitcom veteran Ed O'Neill. Yes, Ed O'Neill took cues from Bruce Lee and earned a Black Belt! It evidently helped with growing up in the Mahoning Valley. One should never look at Al Bundy the same way again. But the secret weapon of I AM BRUCE LEE is Lee's elegant widow Linda (spookily resembling Lauren Holly, who played her in DRAGON). Part of a melancholy line of celebrity widows in the unenviable position of upholding their men's legacies (Norma Shearer, Lauren Bacall, Judy Jacklin Belushi, Terri Irwin, Lisa Niemi etc. ), and with the additional tragedy of Brandon Lee in the background - barely mentioned but impossible to ignore - she comes across as dignified and skillful at the exposition, denying any conspiracies or supernatural kung-fu mumbo jumbo in her husband's sudden, shocking 1973 death a month before release of ENTER THE DRAGON (and frankly acknowledging that he suffered his fatal aneurysm in the apartment of a mistress). The points are made that Bruce Lee became a cross-cultural, pan-disciplinary icon in the 1970s and afterwards, comparable to Muhammad Ali (and just as popular with blacks, who related to Lee's ethnic-outsider status). His Jeet Kun Do "style" wasn't so much a formal style as a rejection of martial-arts dogmas and schools that, to Lee, just seemed to engender division and personality cults. 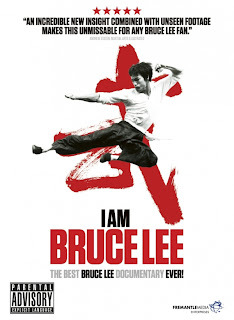 Martial-arts in general, as per Lee, came down to self-expression in any form, whether in acting or whatever endeavor (and, it is noted Bruce Lee was a cha-cha dance champ as well). But he was a darned good actor, as someone points out using a shot in ENTER THE DRAGON in which Lee’s character must violate his own principles and murder a defeated foe in the arena. Lee’s agonized face registers more emotion in one non-verbal take than Stallone or Van Damme invested in whole movies. There is a lot unanswered, or oddly left out. No input from John Saxon or Jim Kelly? A sidebar about Lee’s planned script “The Silent Flute,” with no mention that eventually a version of it actually was filmed (as CIRCLE OF IRON, starring David Carradine, something of a lifelong career rival). No mention of additional planned Lee projects that never were, including a takeoff on the character Drunken Master. No mention of the legend that Lee had a kick of such superhuman velocity that 24 frames per second was inadequate to capture it on film. We do get confirmation, though, that when Green Hornet reruns were exported to the Far East, they aired under a new name: The Cato Show. And, yes, Bruce nearly walked off ENTER THE DRAGON, until some good, meaningful dialogue was added expounding on martial-arts attitude and philosophy, one of the better actor-as-auteur moments in cinema history. Brando and Bruce Willis, eat your hearts out. And it’s nice to see an appreciation of THE CHINESE CONNECTION (AKA FISTS OF FURY) for its complex anti-Japanese, anti-collaborationist political content that escaped most western audiences (especially in the English dub over the original Cantonese dialogue). Recently Jet Li remade THE CHINESE CONNECTION as FIST OF LEGEND, putting back much of that drama.